Second self-recorded album from this Chicago punk quartet. Chicago punk band Negative Scanner return to the fray with their second long-player, the cheekily titled Nose Picker. Once again recorded by the band themselves in their Chicago practice space, Nose Picker opens with a question; “Is there anybody there?”, which acts as both a legitimate query as well as a rallying cry. 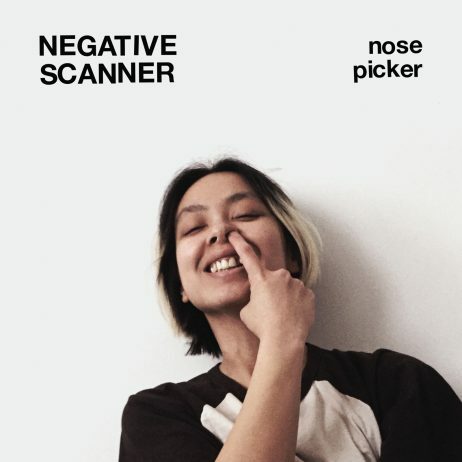 Negative Scanner make it clear that they want your attention, as opening tune “T.V.”s stutter step guitar riff leans into an lean and mean, 4-on-the-floor churn. The rest of the album follows suit, either with raging punk snarl (”History Lesson”, “First Blood”, “Let it Die”), or angular, emotive jagged guitar riffage (”A Cross”, “10 Million Kids”, “The Only One”), punctuated by vocalist/guitarist Rebecca Valeriano- Flores’ voice, teetering between a full throated roar and a plaintive monotone. Her lyrics are insular, spitting accusatory and inquisitory barbs inward, talking to anyone who listen. Is there anybody there? Despite the darkness on the surface, Nose Picker has an unmistakable air of whimsy, and a sense of humor, punctuated by the very literal album cover, and by the sound of a toilet flushing at the album‘s closing. The past two years have seen the band step out of the Midwest DIY spaces and basement shows and tour the USA and Europe, support UK band Sleaford Mods on select dates in the UK and the USA and standing toe-to-toe with the underground’s finest acts, including Sheer Mag, Protomartyr and more. FORMAT: Snot Green Coloured Vinyl.